Woodlawn bound 4 train approaching the 161st Street-Yankee Stadium station. Resized photo courtesy of Eye On Transit. In our continuing effort to solicit feedback from our customers, MTA New York City Transit is again distributing Rider Report Cards throughout the system. 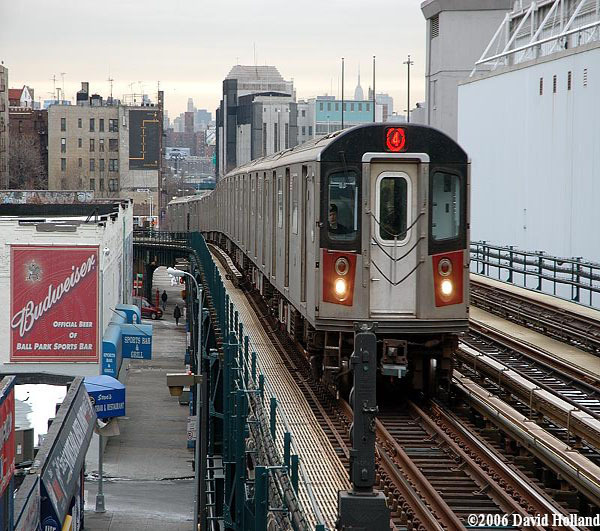 Riders on the 4 are next in line of NYC Transit’s over five million daily subway riders asked to rate the progress of their line since the initial round of report cards was distributed in July 2007. The report cards are being distributed to riders during the morning rush hours from Tuesday, October 14th through Friday, October 17th. The cards will be handed out at several different stations along the line each day over the four-day period. Grades will be used to identify rider preferences and to gauge how much improvement customers along the 4 line have noticed since last year’s report card. Again, the Rider Report Card will ask subway riders to grade 21 specific areas of service from an A (Excellent) to an F (Unsatisfactory). Among the areas riders will grade include: car and station cleanliness, safety, security, quality of announcements, and the courtesy and helpfulness of front line customer service staff. Riders will also assign an overall grade for 4 line service. From this list of 21 service attributes, riders are also going to be asked to rank the top three improvements they would like to see made to this line. •	Tuesday, October 14th – Crown Heights-Utica Avenue, Franklin Avenue, Atlantic Avenue, Nevins Street, and Borough Hall. •	Wednesday, October 15th – Bowling Green, Wall Street, 59th Street, 86th Street, and 125th Street. •	Thursday, October 16th – 138th Street-Grand Concourse, 149th Street, Grand Concourse, 161st Street-Yankee Stadium, 167th Street, and 170th Street. •	Friday, October 17th – Mt. Eden Avenue, 176th Street, Burnside Avenue, 183rd Street, Fordham Road, Kingsbridge Road, Bedford Park Blvd.-Lehman College, Mosholu Parkway, and Woodlawn.